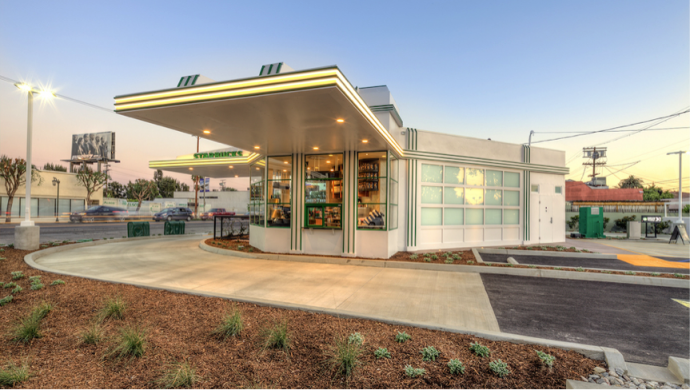 Starbucks has recently transformed an old gas station in Los Angeles into a new drive-thru coffee shop. The gas station has been out of use for 20 odd years, but Starbucks has brought it back to life. Using bright neon lights and creative restoration, keeping the original 1950’s heritage and historic value to the location, Starbucks have created an engaging brand experience of the highest order. A great example of identifying an opportunity to re-define the famous Starbucks ‘Third Place”. The gas station closed in the early 90’s and was nothing more than wasted space, surrounded by overgrown shrubs and clearly an eyesore. The newly renovated building now offers coffee lovers an option to grab a coffee on the run, or alternatively they can enjoy some sunshine on the outdoor patio. The ultimate customer experience and “Third Place” defined by Starbucks is said to be the place that people to go to in-between home and work. The environment inside your local Starbucks is always warm and inviting, it has friendly staff, comfortable chairs and consistent coffee. The new drive-thru is now an extension of the “Third Place” combined with convenience and ease. 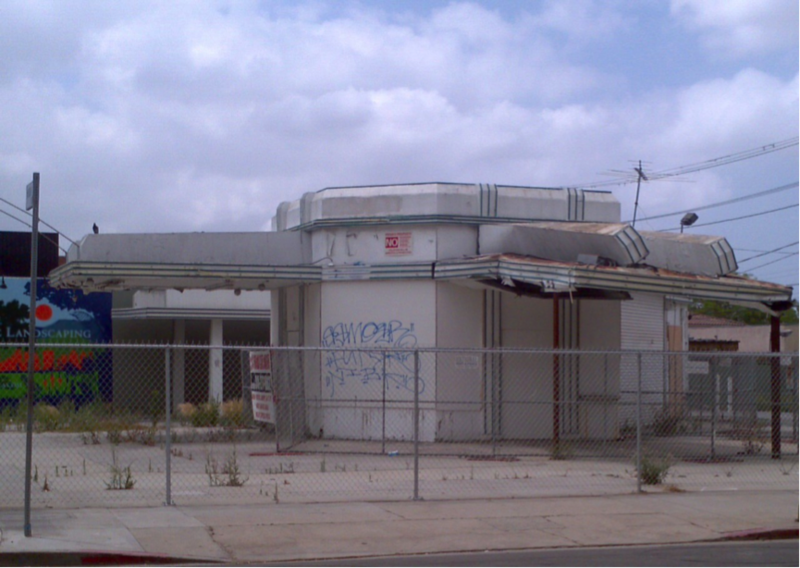 Architect Elizabeth Valerio worked closely with the city of Los Angeles and a historical administrator to uphold the art deco charm of building, while transforming the run down mess into a modern Starbucks cafe. The story behind the building also holds some Hollywood celebrity and film history, being the location that was used in films like LA Story and 48 Hours starring Eddie Murphy. A new tourist attraction, photo ‘op’ and caffeine hit to say the least. Starbucks weren’t shy to take advantage of the plain canvas by branding the new and restored building with their mermaid-like emblem. The location of the new Starbucks drive-thru is well positioned, as there is a high population of coffee enthusiasts, and now an even more convenient way to get a ‘Grande Frappuccino’ or two. Combining old with new is already a winning combination for hipster brands nearby who overhauled out-dated cinemas, condos and apartments. Understanding consumer needs of valuable time and convenience certainly works to their benefit. Sipping on a $5 multi-chain Starbucks coffee can now be enjoyed with some 50’s authenticity. Microsoft (finally) enters the tablet fray – But do they have a brand mandate?